Yes, it’s true! Your cat can be trained to walk on a leash. While letting your cat outdoors is not something we recommend, if your cat insists on going outside and you live in an area where it isn’t safe to let cats outside on their own because of traffic or other dangers, the only way you and your cat can have fun outside is to train them to walk on a leash. It’s not difficult to introduce your cat to the leash and if your pet is familiar with it, you can enjoy frequent outings together. Will Your Indoor Cat Enjoy Going Outdoors? You can let a cat outdoors on a leash if it absolutely insists on going outside. You need to be vigilant, of course, and make sure your pet is protected as much as possible against various bacteria, parasites, poisons, and the usual outdoor dangers that they may encounter. You also have to accept the fact that outdoor cats are never as safe as indoor cats because of the dangers. This is why we don’t recommend letting cats outdoors in the first place. Having your cat on a leash is the safest way to protect them if they want to be outdoors. You may decide that you want your cat to remain indoors unless on a leash. The question is, will going outside be a treat and will the leash be accepted by your cat? Maybe – Cats that are trained to walk on a leash generally enjoy being outdoors and exploring. As long as cats are trained slowly and at an early age, most of them can adjust to the outdoor experience. Walking on a leash can keep them from becoming bored and lazy. It allows them to have regular exercise, which helps to maintain their health and weight. It can also be fun for both of you! Maybe Not – Some cats are never comfortable walking on a leash because of their personalities, their age, or their health. If you spend a lot of time slowly and patiently introducing the harness and leash with plenty of treats and praise, but your cat continues to resist, it is time to give up. Accept your cat’s decision to not walk on a leash and play indoor games instead. When training your cat, each stage requires treats, praise, and patience. 1. Purchase the Right Equipment – The “right equipment” means a harness, not a collar. Cats can slip right out of a collar, so make sure you buy the correct sized harness, preferably one that is adjustable. 2. Introduce the Harness – Leave the harness near the food dish so your cat associates it with something nice—food, of course! If the harness makes a snapping sound or the characteristic Velcro sound when the harness is adjusted, make those sounds with the harness multiple times for several days so that your cat is used to the sound before you try fitting it on. After a few days to two weeks, put the harness on your cat right before mealtime, and take it off afterwards. Repeat for several days. Once your cat is used to the harness, try adjusting it for size—you need to be able to fit two fingers under the harness. Leave it on for a few minutes and offer your cat a treat, some praise, and a pat on the head before taking it off. 3. Introduce the Leash – Your cat may not mind wearing the harness or it may take several days or weeks before it is accepted; take your time. When your cat is used to wearing and walking around with it, attach the leash. Let it drag on the floor while you feed your cat treats, give praise and a pat on the head, play for a bit, and then take it and the harness off. After the leash is accepted, pick up the end and follow your cat around the house with the leash slack in your hand. Don’t forget the praise and treats! Then try gently coaxing your cat with a treat while guiding the harness. Don’t allow your cat to back out of the harness because you don’t want that to happen when you are out on a walk. Repeat this exercise daily for a few days. 4. Take Your Cat For Walks Outside – With the harness and leash attached, pick your cat up in your arms and walk out of the house. Never allow your cat to walk out or your cat will be streaking out the door whenever it is opened. Carry a towel with you in case your cat gets scared when you put them down on the ground. That way, you can quickly wrap up your cat in the towel to avoid being bitten or scratched before taking them back into the house. Try going outside each day for an hour, always staying close to the door so that you can go back inside at a moment’s notice. After building their confidence while outside, your cat will soon enjoy going for walks. If at any point your cat drops to the ground with tail twitching and ears flattened back, stop the training session or the walk. Your cat is always the boss and you do whatever the boss wants! Don’t tie up your cat outside and leave your pet unattended. A cat can be tangled up in the leash in no time or be spooked by another animal or a person and can’t get away. Keep your cat from picking up items and licking or chewing anything. Have some treats handy as a distraction. Remember that you are walking a cat, not a dog. Cats tend to be less inclined to be guided by a leash and they may decide for no obvious reason that today is not a good day for a walk. Or they may decide a walk is fine, but not at the same place as before, even though it was a perfectly acceptable place yesterday. Most cats can be trained to walk on a leash, but not all. If you live in an area where it isn’t safe to let a cat outside and your cat refuses to cooperate with your training efforts, resign yourself to enjoying only indoor adventures with your pet. Again, we don’t advise letting cats outdoors, but if you need to then using a harness and leash is the safest way. However, you could be lucky. Purchase a cat harness and leash and try training your pet. It may take many weeks of effort or you could be out walking with your cat quite soon. You’ll never know until you try! As the weather gets warmer, seasonal care for cats is needed. There is a way to plan a summer of fun with your cat and ensure they are safe, healthy, and happy! To do that you will need to know the seasonal conditions worth preparing for. You can also check out activities to keep you and your kitty entertained. If your cat is an outdoor one, it’s crucial you anticipate and prepare for the risks that exist whenever he or she goes out to play. Even if he or she is an indoor cat, there is the possibility it may decide to stop lazing about and rush outside when an unscreened door opens or when an open window invites it to find freedom. Teach it its name. Use its name often and always when you call to it for dinner. Cats can be hyper aware of the sound of dinner preparations—the noise of the can opener, the crinkle of the dry food bag, and the clatter of silverware tapped against their food bowl—so you should call his or her name whenever you go to get food so he or she connects the name with the pleasure of eating. Also, call him or her at various times and have a treat in your hand. He or she’ll catch on so when he or she is outside and hears his or her name being called, he or she’ll probably come. Make sure your cat has received the vaccinations he or she needs such as rabies and de-worming preventatives so he or she can play outside without risk. Equip your cat with an ID collar. If he or she has not had preventative flea treatment from his or her veterinarian, get treatment right away and then put the ID on an easily detachable collar. If he or she gets lost, anyone who finds him or her can contact you, and the collar will prevent your kitty from being caught in a dangerous situation. Have an ID microchip registered with your cat’s name, your name, and your phone number embedded under the skin. 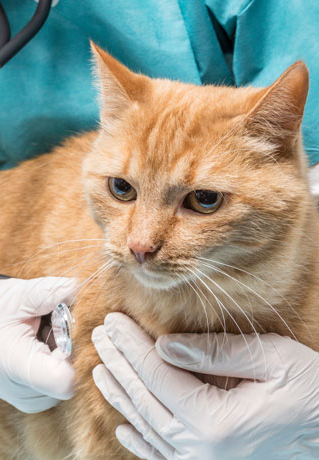 This is a simple, painless procedure that your veterinarian will be happy to perform at your cat’s next checkup or if you call ahead before an appointment. Shelters and animal hospitals always scan for microchips when lost or injured cats are brought to them and they will contact you. If you are travelling with your cat, don’t leave it alone in the car. Take it with you in a travel case even if it becomes awkward to carry. You probably don’t need another reminder of why you must do that, but here is another one anyway: if you leave your pet for only a minute and circumstances turn that minute into an hour, your beloved pet may be trapped in a dangerously hot car, and possible heat stroke can occur. If your cat is in accident, a fight with another animal, or shows unexpected symptoms of illness or poisoning, take him or her to a cat clinic or hospital as soon as possible. Have the phone number and address handy at home, or on your phone so there will be no delay. Make sure you know the common symptoms of problems, illnesses, or poisoning for which you need professional help. It’s a good idea to be familiar with basic first aid too such as how to keep a frightened, injured cat from biting you and how to transport an injured kitty to a cat hospital. Remember that cats will try and conceal pain because it shows weakness to their enemies in the wilds and makes them targets for attack. This instinct is so strong that they will not show their distress to their loving owners either. Be alert. If your cat comes into the house and immediately hides, or if an indoor cat hides and won’t come when called or to eat, it may be in pain. Examine it carefully and give it whatever help it needs. Cats love warm weather but older cats and kittens are less tolerant of the heat and sun. Watch out for conditions that could cause heat stroke or dehydration for cats of any age. Water – Keep your cat’s water bowl full and check it often as he or she will need more water than usual when the weather is warm. It is a good idea to have more than one bowl of water available. Check out our blog post if you’re not sure just how much water your kitty will need. Sun – Your cat is better off inside on very hot days or during the hottest time of the day (between 10am and 3pm). Once the temperature has lowered and he or she insists on going outside as usual, make sure a water bowl goes outside with him or her, and make sure there is shade he or she can reach when he or she wants to get out of the sun. A cardboard box on its side can do the trick. Inside the House – When your cat is indoors, make sure it’s not trapped in a room that gets too hot for comfort. Cool tiled floors, open screened windows, fans and air conditioning, and closing blinds and curtains and windows during the hottest time of the day can all help keep kitty cool inside. Walks – If you take your indoor cat outside for a walk, choose the coolest time of day and stay off the hot pavement and sidewalks. Test these with the back of your hand for five seconds, and if the surface is too hot for your hand, it’s too hot for your cat. Cooling Suggestions – Try putting cold water in a hot water bottle or cool a towel in the freezer and put it on their bed so kitty can lie on it. You can also put an ice cube in his or her water bowl to give him or her something to play with while also staying cool. Pest Protection – Keep your cat safe from outdoor pests, even if he or she is an indoor cat. Fleas and other parasites can be carried indoors on footwear and clothing and if other pets are visiting. Even indoor cats can suffer from flea allergy dermatitis. Check outdoor cats carefully for ticks when you are grooming them and bring them to a vet ASAP if you find any that have latched on! Make sure your pets are protected from all parasites with regular treatments from your vet. Check out our blog post on the subject if you’re looking for prevention tips. Vaccination Schedules – As we mentioned before, it’s a good idea to keep your cat’s vaccinations up to date. Diseases don’t take a vacation and your outdoor or indoor cat needs his or her booster vaccinations for protection. Your kitty may also need booster shots for non-core vaccinations (e.g., leukemia) if it is receiving them. Don’t let vacation plans interfere with kitty’s healthcare! Cat Disease Safety for Humans – Be alert for diseases that can spread from cats to humans, especially if you have children in your house. Caution them against touching cat feces, touching cat litter (and be careful yourself! ), or playing in sandboxes that are not covered. Keep your cat off of surfaces in your home where food is prepared or eaten. Toys – Cats love toys that appeal to their hunter instincts such as mice, bugs, and birds. You can attach a toy to a length of string and take your cat on a merry chase. Use a laser pointer to skip along on the floor like a bug does. Expect your cat to get bored quickly and be ready with another toy to replace it. Let it catch something now and then and put a treat someplace where the toy or the laser takes it in order to keep kitty entertained. An empty box provides amusement for a long time! Training – Take time in the summer to train your cat. Work on having it come when you call, teach it to stay off of furniture (like the table where you eat), or to stop scratching couches or climbing curtains. You can take your indoor cat on walks using a leash. Try to help your cat adjust to riding in the car by letting it get used to their travel carrier in the house. Put some toys or treats inside so kitty can go in and out and get used to it before taking him or her out to the car. When you take kitty out on a ride, give it a treat just before you start the engine. Blow bubbles from a non-toxic solution outside in a safe area where your cat can jump, chase, and catch them. Show your cat a treat and place it under a plastic cup so he or she has to figure out how to knock it over. With some preparation, you can have a fun summer with your cat while making sure he or she stays safe, healthy, and happy, and in turn makes your summer more enjoyable, too! Did you know that? It’s true—cats catch colds just like humans do. Normally if they catch a cold the symptoms will clear up in a few days. Still, it’s best to stay alert and take your kitty to a veterinarian for testing and treatment if those signs last longer than a few days. The symptoms of a cat cold are the same for humans: sneezing, watery eyes, runny nose, fever, a loss of appetite and energy, and even a loss of the voice (i.e., their meow). However, as with humans, the symptoms could be caused by something more serious than a mild cold and should not be ignored. Exposure to, and infection from, bacteria or a virus or a combination of both spread by direct or indirect contact with other cats who are contagious or have a chronic condition, or by contaminated objects. A secondary infection that develops after a few days of experiencing a simple cold, which increases the intensity of the symptoms or of particular symptom, depending on where the secondary infection strikes. Symptoms of a simple cold will usually clear up in anywhere from two to ten days. If it continues or does not improve beyond the initial couple of days, take your kitty to a veterinarian. Cats are usually unhappy about changes in their routine or their surroundings, like moving to a new residence, a family member leaving home or a newborn arriving, their main caregiver no longer at home most days, or a new pet being introduced into the household. Stress from such changes may lead them to be more vulnerable to viruses and the flu. A cold will weaken your cat’s immune system and make him more vulnerable to secondary infections that can follow a simple cold. A weakened immune system caused by any number of stressful situations can lead to the development of an illness or a secondary infection, especially in young kittens and older cats. There are two main viral infections that can cause cold symptoms, and they are the herpes virus and the feline calicivirus (FCV), both of which are very contagious between cats. Fortunately, ill effects of these viruses can be prevented by making sure your kitty’s standard vaccinations are kept up to date. These vaccinations greatly reduce the symptoms and the severity of these illnesses. Feline Herpes Virus – This is similar to humans only in that a cat may have it for life. It’s best to have your cat vaccinated against herpes as a kitten and then take booster shots when required. This will help your cat develop more antibodies to fight the disease. Although there is no treatment that will completely cure the herpes virus, good overall care and prompt treatment of symptoms from the virus can help cats live a very normal life. Feline Calicivirus – There are unfortunately hundreds of strains of this virus that your cat can catch, and if they do catch one of them, afterwards they may become a chronic carrier if their immune system is too weak. This is why regular vaccinations are very important, because if your cat encounters one of the strains included in their vaccine, your cat will probably show nothing more than sneezing and a runny nose. However, there is a slight chance that they may catch a strain that has mutated over time. If this happens, your kitty may develop ulcers on the tongue, throat, roof of the mouth, and around their nose—take them to your vet for treatment at once! There are three main bacterial infections that cause cold-like symptoms in cats: mycoplasma pneumoniae (feline infectious anemia), bordetella bronchiseptica (feline kennel cough), and chlamydia psittaci (feline chlamydiosis). Fortunately, all of these infections can be remedied with antibiotics. If your cat shows symptoms of a cold plus conjunctivitis (similar to “pink eye” in humans), they may have contracted Mycoplasma, which is very common, or possibly the rarer Chlamydia. If he or she has a cold accompanied by coughing and gagging, it’s possible they have kennel cough, although this is rare in cats. Your veterinarian will know how to test for these infections and will prescribe the best medicine for whatever infection it is. You can introduce viruses and bacteria into your home on your clothes or your skin, which means that even an indoor cat can catch a virus or any other infection. Most cats catch illnesses from other, unvaccinated cats. If you have more than one pet, or if you let your cat outside even for brief periods of time, it is doubly important to use precautions. Make sure your kitty has all the booster shots they need as advised by your veterinarian. Ask your vet if there is any merit in taking a supplement when your cat is under stress—moving, leaving home for any reason, introducing a change into the household—to keep their immune levels at maximum. Regularly clean and disinfect items that your cat shares with any other pets (e.g. litter boxes, bowls, blankets, beds, and carriers). Make sure that any new pets introduced into the household have been checked over by a veterinarian. Never give your kitty medications intended for humans, but do make sure you give them all the medication prescribed by their veterinarian for as long as you are directed. Don’t stop just because your pet seems better. If you’re having a hard time persuading them to take the medication, ask your veterinarian for help. If a stuffy nose keeps kitty from eating a normal amount of food, try enticing them with special treats. You can also try soaking dry food in warm water, or offering a little wet food. Keep an eye on their water bowl and make sure they’re drinking as usual, and urinating and defecating normally. If there are any issues, consult your veterinarian. Playing with your cat to keep them happy in a hot and steamy bathroom may help open up your cat’s airways and make them more comfortable. Your cat will love warm blankets for their bed! You can gently clean the discharge from their eyes and nose with a warm washcloth. Having the cold whether you’re a cat or a human stinks! If your cat’s caught one, always watch them carefully and take them to your veterinarian for testing and treatment if they’re not back to normal within a few days.